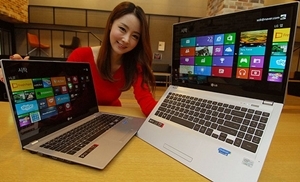 LG has recently released its Ultra book U560 that featured 15.6 inches of screen size with windows 8. The laptop has 1080p IPS display for wide viewing angle and with enhanced color accuracy. As told by different authors on blogs the device likely to be an alternative for the Apple MacBook Pro with retina display and amazingly it’s lighter than the MacBook Pro. After it’s released in market only buyer’s reaction towards Ultra Book U560 will say that it has become successful pilfering sales from MacBook Pro or hasn’t. Price of U560 still undeclared, in its early days it will be only available in Korea and then step wise with other countries of the world.